With a wide array of precisely-calibrated edgers available to keep your yard manicured and under control, it’s easier than ever to maintain your curb appeal. Here, our buyer’s guide walks you through the basics and helps you find the lawn tool that’s best for you. Whether your yard is large or small, minimally landscaped or filled with flower beds, one of the easiest ways to keep it looking sharp is to invest in a quality lawn edger to tame unruly edges. Much like framing a picture enhances your home’s artwork, maintaining an evenly trimmed perimeter elevates the overall appearance of your lawn. Its crisp edges signify a well-tended property—particularly when you pay close attention to growth along the edges of your driveway, sidewalk, garden beds, and walking paths. Simplify your search for the best lawn edger by identifying your property’s needs using the shopping guide below and starting with the roundup of the most highly recommended and well-reviewed models around. Start (with) your engines. 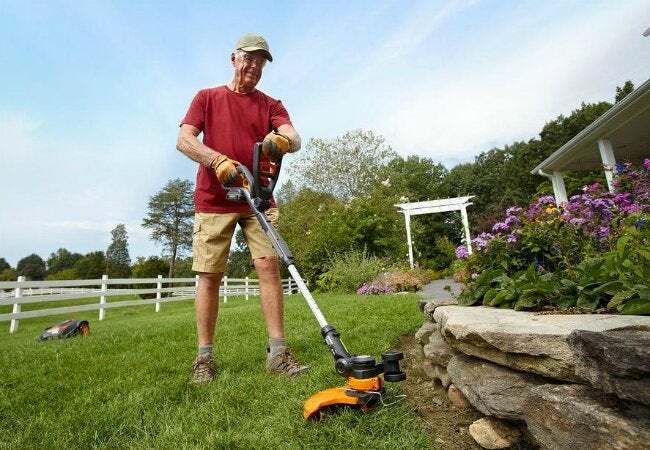 Generally speaking, there are two kinds of lawn edgers: those with electric engines, and those that run on gas. 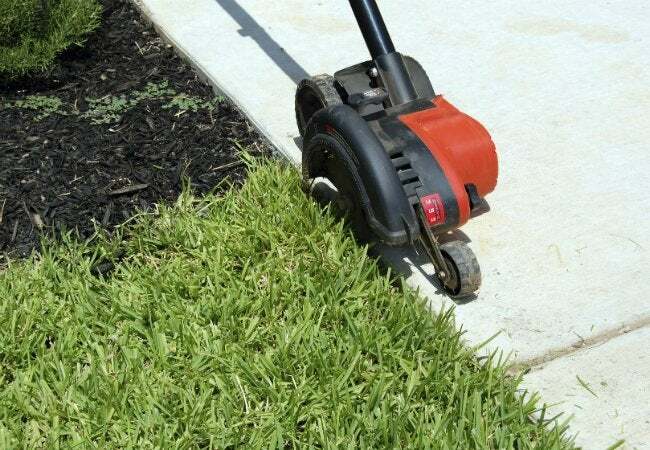 • An electric-powered edger—often the more budget-friendly option and top choice for homeowners with a small outdoor space—will either run off of a battery or plug in to an electrical outlet via a lengthy cord. Though it only boasts 18 or so volts of power, a battery-operated model allows you to trim anywhere, no matter the distance to the nearest outlet. Alternatively, a corded model’s trade-off is more power (usually 10 to 12 amps) for slightly less mobility (or, at minimum, the use of an extension cord for larger jobs). • A gas-powered edger, available in a two- or four-cycle format, is more powerful and therefore better suited for larger yards. While two-cycle engines are more common, they require you to stock and refuel using both gas and oil—far less environmentally conscious than four-cycle engines, which run clean but cost and weigh more. Wheels up. While lightweight manual edgers move on nothing more than the guidance you give them, the weight of an engine typically requires three or four wheels to cover your grounds without strain. In all wheeled models, the rear wheels are responsible for moving the entire unit along, while a guide wheel keeps the blade aligned with the task at hand. 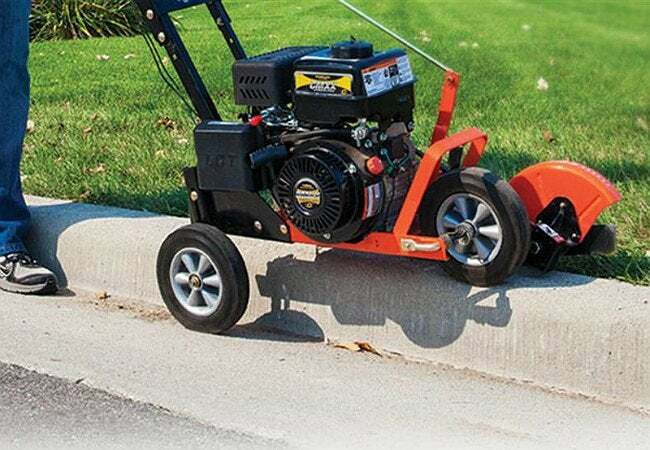 Some gas-powered edgers offer the addition of a fourth wheel (a “curb wheel”) to help stabilize the edger when you’re using it at a slight drop-off, such as the line where your lawn meets the street. If you opt for an electric model or will not be maneuvering too many curbs, a three-wheeled edger might be all you need. • Flat rectangular blades with plain edges are most common among lawn edgers, suitable for basic edging jobs where the lawn is flush and level with the nearest hard surface (like a driveway or sidewalk). • Flat rectangular blades with scoop-cut edges carefully handle the perimeter of more delicate landscaping features like flower beds, which might otherwise be disturbed by the debris in a rough cutting. These blades are also ideal to employ when the lawn and hard surfaces are uneven. • Star-shaped blades aptly cut lawns that end at a wall or sturdy fence. If you have only a few needs to address, you could get by with purchasing the desired replacement blade(s) of your choice for the edger and swapping them in as necessary—while easy enough, this transition does add some time to the yard work. The staff of Popular Mechanics gave this four-cycle, gas-powered edger its highest ranking for its power, durability, and controlled handling, which was virtually free of any vibration or shaking as it cut. Clocking in at a solid 85 pounds, it’s certainly not lightweight, but its reviewers insist that’s part of why it gets the job done so well. What’s more, its seven—yes, seven—angle settings and four depth settings allow you to customize the cut for almost any challenge your yard poses. Available on Amazon. 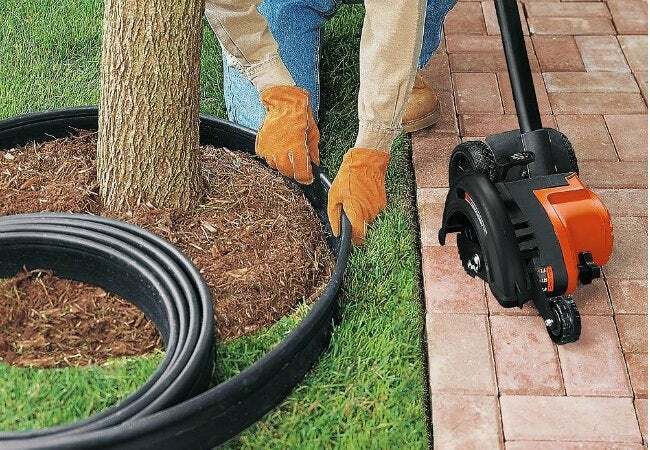 Earning a strong 4.5-star rating from Home Depot customers, this battery-powered trimmer/edger combo offers two utilities in one without the noise, expense, and environmental detriment of gas and with more mobility than its corded counterparts. With a telescopic shaft that tilts 90 degrees in hard-to-reach places, its versatility is rare in the under-$100 category. Running on a 20-volt lithium battery, the 7-pound model is lightweight and easy to use. Available at The Home Depot. By far the most popular lawn edger with Amazon buyers is this three-wheeled electric “little engine that could” from Black + Decker. Sold at an agreeable price point and ranked 4.5 out of 5 stars by more than 1,200 customers, the corded electric model packs an 11-amp punch, built-in cord retention for hassle-free storage, tool-free assembly, and even assist handles for both righties and lefties alike. Available on Amazon. With just a bit of elbow grease and the right edger to spruce things up, you can enjoy a perfect perimeter around a lawn where the grass is always greener—or, at least, the edges are always cleaner.